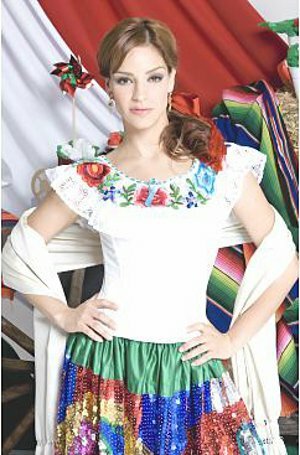 There is a great variety of Mexican dresses. And there are so many types of dresses because of the very rich cultural background throughout Mexico. There are the modern Mexican dresses with indigenous influence and the traditional dresses: embroidered, folkloric, typical, regional or pr-Hispanic dresses. There are popular designs of Mexican fancy dresses with embroidery or or Mexican symbols and styles. These dresses are created by designers that are interested in promoting Mexican traditions and textile culture. Mexican wedding dresses are beautiful, simple and elegant designs for a town or beach wedding. There are also summers, spring, fall or winter wedding dresses, or short, corset or vintage wedding dresses. Mexican embroidered dresses are usually colorful, simple and ethnically handcrafted. 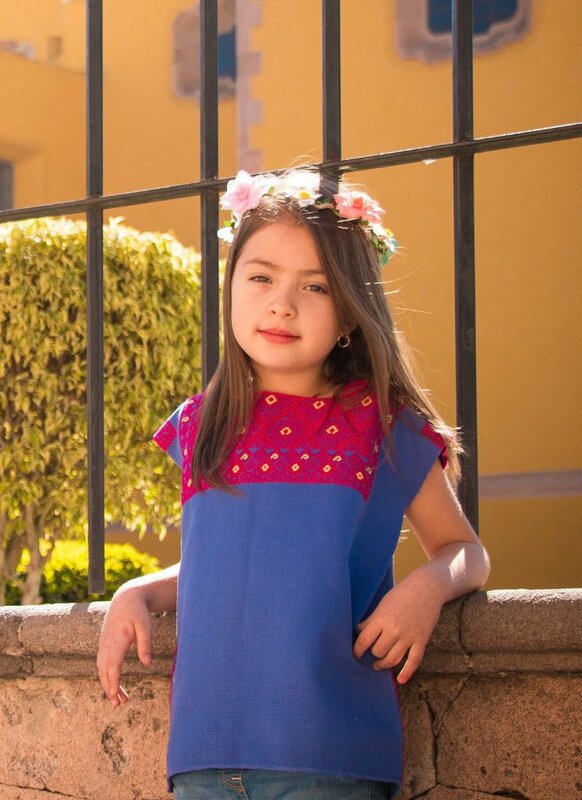 There are many regions where you can find original, authentic Mexican embroidered dresses; but the most famous are from the states of Puebla, Oaxaca, Chiapas and Yucatan. 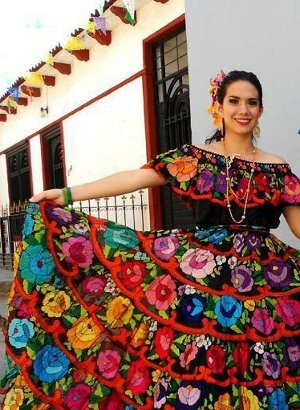 The Jalisco dress is a folkloric style. The dress has a wide and full skirt specially designed for folkloric dances. This dress is also called ranchera dress. A similar variation called the ribbon dress for escaramuzas is used in Charrerias (Mexican style rodeos). 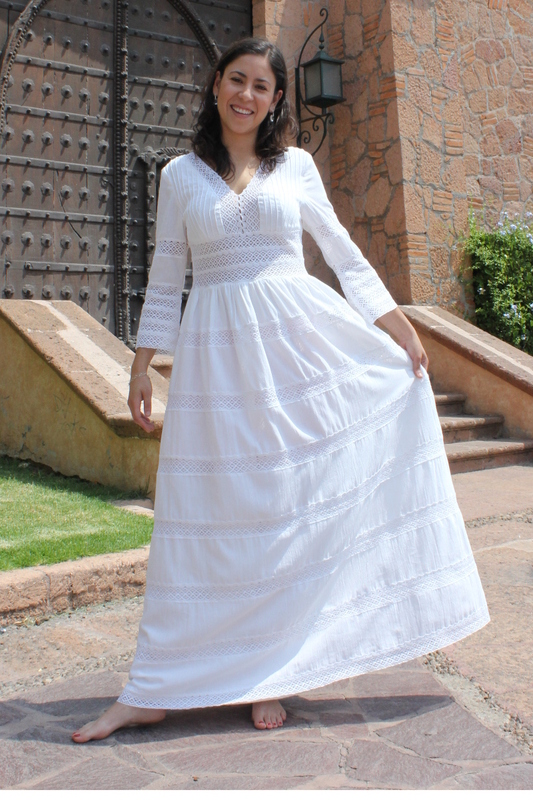 The Adelita, soldadera or revolutionary dress is in reality a version of the Jalisco dress with a stamped fabric skirt in lieu of the plain color with ribbons. It was used by women that would come to the battlefield and traveled with the revolutionary armies to help to cook meals, provide care to the wounded, wash clothes, etc. The China Poblana dress is the typical outfit of the state of Puebla. It has Asian influence from the time when Spain colonized Mexico and the Philippines. It has a white blouse and a colorful embroidered red and green skirt. They also include designs with national symbols of Mexico such as an eagle and a snake on a prickly pear cactus. The Tabasco typical dress is becoming very popular thanks to its simple yet beautiful design. The skirt is typically a stamped flower pattern, but the gala version is on dark blue fabric. The nice hand embroidered ribbons make you look stunning. This Chiapas typical dress is truly a work of art from the town of Chiapa de Corzo. The dress is made out of satin which feels like silk and flounces are sewed with large embroidered flowers. If we refer to pre-Hispanic dresses the more recognizable ones would be those related to the main civilizations in México; Thankfully, these dresses are still made by indigeneous people today and they use the same techniques, forms and colors that were used before the Spanish colonization. For example, they still use back-strap looms, with forms of squares, rectangles and parallelograms. Aztec dresses are probably the most unique style within Mexican clothing. With rich history, these pieces are sophisticated. They do offer symbols and ideas to designers which make modern extraordinary garments. Mayan dresses have very nice designs of big flowers that make these pieces in fashion. Dresses you like the most! 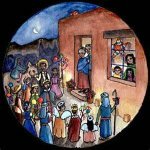 Mexican Christmas traditions are great for families to transmit values, culture and history to their children. Mexican festivals are famous for its rich cultural history. 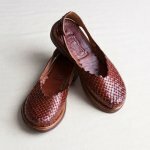 Mexican shoes are usually huaraches, sandals and boots but here are other shoes with typical Mexican designs.